The Best Facebook site form Language Learners of the Thai Language 2013 was awarded to Thai Language Hut SchoolThai Language Hut Language School has the best 2013 Thai – English Facebook page in the world. Announced this week by competition organizers LexioPhiles and Bab.la, Thai Language Hut School has the highest ranking Facebook site for Thai and English language learners. 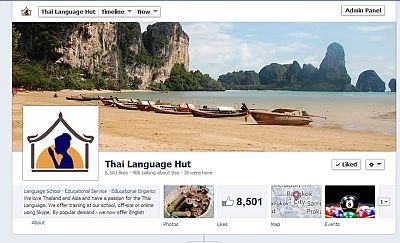 In a stiff competition to find the best Facebook language sites Worldwide, jointly organized by LexioPhiles popular language blog and Bab.la the well known online dictionary and language learning website, Thai Language Hut school was voted 21st out of a 1024 nominated and 100 shortlisted Facebook language pages. The competition included famous sites from the BBC (Ranked 11th) and Oxford University Press (Ranked 15th). In a competition where the majority of the sites were focused on English or German the Thai Language Hut Thai – English site stood out. Votes were cast by users of LexioPhiles, Bab.la and the shortlisted Facebook language pages. The school which teaches Thai and English as private lessons, one teacher to one pupil, in Sukhumvit 43 and Online using Skype, commented that the Facebook site was really a part of school policy to give something back to those that cannot afford to learn Thai at their or another school. And also for those that are studying Thai or English and want the chance to practice their language or cultural knowledge. Thai Language Hut (TLH) established in 2006 is a specialized school delivering flexible private Online/Offline language learning solutions for Thai and English from its base in Sukhumvit Road, Bangkok. The school teaches using Professional language learning materials from the number 1 publisher of SE Asia language learning materials, Paiboon Publishing. TLH is the only trusted delivery partner for Paiboon Publishing. The school is owned by Cambridge Language Consultants Co., Ltd a Thai company; people with a passion for imparting language to language learners. Paiboon Publishing was established in 1996 in Berkeley, California, USA by Benjawan Poomsan Becker. The company also has an office in Bangkok. The unique Thai/Western links have helped Paiboon Publishing produce and publish high quality, user-friendly language books, audio, Smartphone apps and other learning materials that allow people to learn and communicate effectively. Our products are sold in bookstores throughout Thailand, online direct from our office in the US and distributors in Europe.